The digital switchover is taking place all over the UK with some areas already in digital-only broadcast mode. This means that if your television set hasn’t got Freeview built in or you haven’t got a Freeview set top box then you’re probably watching constant static. It was only a few weeks ago that one of the UK’s largest electrical retailer pulled the plug on analogue television sets completely and are now concentrating on selling digital ready sets for the impending ‘switch off’. So this would be the perfect time to start looking in to your options, and one of these could be the TVonics DVR-FP250 Freeview recorder. The compact all black design will slot comfortably in to any TV cabinet or you can stand it up using the supplied stand. Compared to other Freeview boxes I’ve come across in the past, the TVonics is actually considerably smaller with competing models typically the size of old DVD players in their full deck size. TVonics are pushing this set top box to be a ‘green’ alternative with the chassis made of recyclable aluminium (but not recycled aluminium) with low power consumption and is one of three set top boxes in the UK market that has received the Energy Saving Trust approval (two of which belong to TVonics). What strikes me is the number of features that you would normally find on premium services like Sky+ (a subscription based satellite network in the UK). With a massive 250GB hard drive built straight in to the DVR-FP250, you can record up to 125 hours of programming. The hard drive will also act as a buffer for live TV playback so you can instantly rewind what you’re watching up to the point you started watching that channel. Just like on Sky+, the TVonics has a dual tuner without the need for any extra connections, boosters or cabling – everything is plug and play. Having the ability to record one channel whilst watching another is something that all PVR’s should have and I’m happy to say that they haven’t missed this out of the FP250. You can schedule recordings up to a week in advance using the on-screen TV guide so you don’t need to manually set a timer. Playback of recorded programme allows you to resume from where you left off, start from the beginning or start at different intervals. Thoughtful design like this will save viewers the trouble of having to fast forward when they come back to a programme. The first thing that I noticed when I removed the remote from the packaging was how similar it was in the button layout, style and dimensions to the Sky Digital remote. Not that I’m complaining because it’s a great design! This will appeal to those who are switching off from the paid satellite service and moving towards free broadcast television, so what better way to do this than by switching to a product that has a similar remote design. 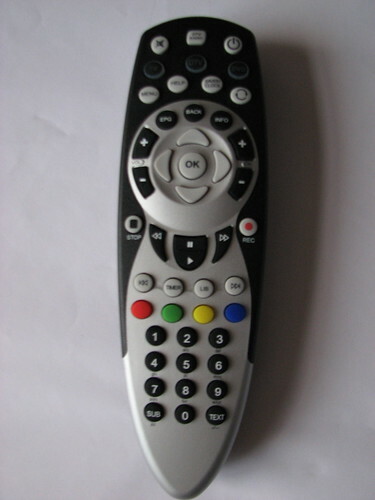 Apart from how simple it is to record programmes, the remote design is the next reason why you want this box. So often is the remote design overlooked, that you usually end up being confused or frustrated when you hit the wrong button or aren’t able to find what you need. Not so with the TVonics. You should be able to pick up the functionality straight away if you’ve had Sky before, if not then you’ll still be able to pick it up very quickly. Connectivity is standard with two scart connections at the back and an aerial in and out port. 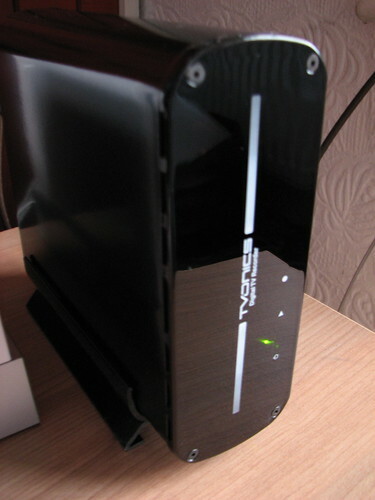 The design has allowed for the twin tuner system without the need for extra cabling since the connections are hard wired already. TVonics won’t win any awards for the design, but this compact set-top box is the only product I’ve tested so far, which rivals the functionality found from subscription based services from the likes of Sky. Many of the features, design and functionality have taken a design queue from the Sky digital service but in my eyes can be seen only as a good thing. Since this is a low powered device, you would also expect quiet operation. 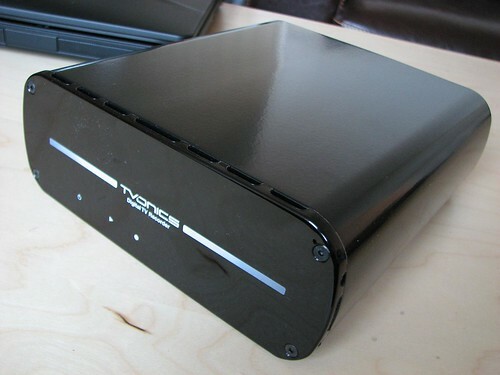 The TVonics emits a low humming noise from the hard drive and fan but it wont be audible unless you’re in a quiet room. With a price tag of over £200, it is rather pricey compared to other set top boxes, but for that you do get all the features you’ll ever need including a large hard drive and a twin tuner and a bonus part of no ongoing subscription costs for the channels, electronic programming guide or twin tuner facility.